Intriguingly, there have been few cases reported where patients with breast cancer BM (BCBM) have responded well to endocrine monotherapy.6–14 In fact, all reported cases of success happened before the year 2000, and the hormonal therapy with a long-term remission of BMs only included treatment with tamoxifen, letrozole, and megestrol acetate. 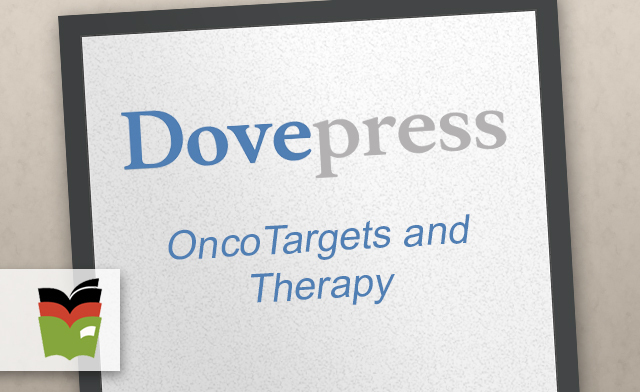 In this report, we present two patients with BCBM who reacted to two different forms of endocrine therapy; one patient responded well to medroxyprogesterone acetate (MPA) and the other patient achieved a temporary partial response (PR) to fulvestrant. In January 2007, a 38-year-old Chinese female diagnosed with right breast cancer underwent breast-conserving surgery and axillary dissection for an invasive ductal carcinoma that was estrogen receptor (ER) positive, progesterone receptor (PR) positive, HER-2 negative, and Ki-67 (25%–50%), with 4 metastatic lymph nodes in the 31 dissected lymph nodes. The pathological stage was IIIA (T2N2M0). After surgery, the patient received chemotherapy, radiotherapy, and hormonal therapy (tamoxifen) as adjuvant therapy. In December 2007, she developed three nodules in the right breast, and histology showed malignant cancer cells. She refused to undergo surgery due to personal reasons and chose to start capecitabine chemotherapy instead. Following five cycles of chemotherapy, the patient was revealed to have had a complete regression of the local tumor, and she then chose to perform a rigorous observation of the local tumor. By July 2009, she had again developed a new local lump in the right breast with progressive enlargement, but she did not undergo further inspections and treatment. Later, in September 2010, the patient was referred to our hospital with lung metastases, pleural effusion, multiple bone metastases, and asymptomatic BMs. Histopathologic examination of the lump in the right breast indicated that the tumor was ER positive, PR positive, and HER-2 negative. 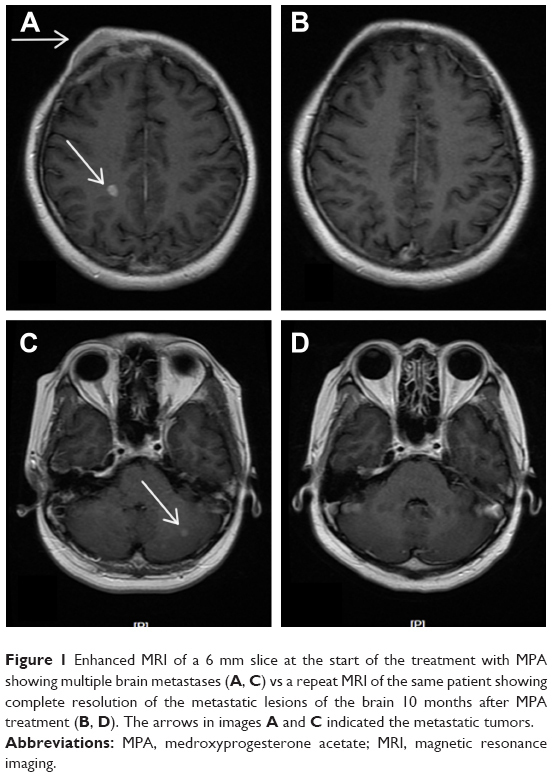 Magnetic resonance imaging (MRI) of the lump showed four hyperdense parenchymal metastatic lesions in the frontal, parietal, and cerebellum regions, with a diameter of 3–8 mm, along with a right frontal bone lesion and suspicious adjacent meningeal metastasis (Figure 1). After a comprehensive consideration of treatment options and her poor performance status, we decided not to perform further cerebrospinal fluid (CSF) examination and chemoradiotherapy. She was treated daily with 1,000 mg of MPA from September 27, 2010 through November 23, 2010, the day she achieved a confirmed PR against the extracranial disease, to August 2011, when a follow-up of an MRI imaging of the brain showed a complete resolution of the brain parenchyma lesions (Figure 1B and D). The field of suspicious meningeal metastasis did not change significantly on the MRI scan, and the patient still did not have any meningeal metastasis-related symptoms. However, the lung metastases and local tumors of the right breast progressed, and then she stopped taking MPA. Subsequently, she was switched over to letrozole and goserelin acetate in August 2011, and this regimen showed a PR with a progression-free survival of 23 months. Regretfully, we could not evaluate the reaction of BMs to treatment further because the patient would not undergo a radiology examination of the brain during her follow-up. Nevertheless, that the patient did not exhibit any neurological symptoms during follow-up was an encouraging finding. A 37-year-old woman was diagnosed with an invasive ductal right breast cancer (the clinical stage was IIIC, T2N3M0) in August 2016. The tumor was ER positive, PR negative, HER-2 negative, and Ki-67 (30%). She was treated with three cycles of anthracycline combined with cyclophosphamide. In October 2016, the patient was referred to our hospital with new right metastatic cervical lymph nodes confirmed by fine-needle aspiration. Consequently, we switched the patient to four cycles of salvage chemotherapy (vinorelbine combined with capecitabine). In February 2017, a positron emission tomography-computed tomography examination revealed metastases of the right supraclavicular and infraclavicular lymph nodes, right axillary lymph nodes, and multiple bones, as well as the presence of suspicious hilus pulmonis, mediastinum lymph nodes, and multiple pulmonary nodules. Considering her poor response to chemotherapy, she was subjected to an aggressive mastectomy. Pathology showed that this tumor was an invasive ductal cancer (grade III), invading the lymphovascular space and nerve and 11 metastatic lymph nodes in 13 dissected axillary lymph nodes. The patient then underwent hormonal therapy (anastrozole and bilateral ovariectomy) and concurrent radiotherapy. Immunohistochemical analysis showed that the tumor was ER positive (>75%), PR positive (1%), HER-2 negative, and Ki-67 (80%). In July 2017, the increased pulmonary nodes on computed tomography (CT) scans confirmed that lung metastases had progressed. The subsequent switch to exemestane saw a further progression of the lung metastases after 4 months. After two successive cycles of VP-16, on January 29, 2018, the patient was found to have developed an isolated BM. Brain MRI revealed a metastatic lesion, with a maximal diameter of 7 mm, in the left parietal lobe (Figure 2). The patient was then treated with fulvestrant 500 mg delivered by intramuscular injection, and a stereotactic radiosurgery for the control of intracranial disease was planned. We found an obvious reduction in the BM through the positioning MRI (1 month after the first dose of fulvestrant injection; Figure 2B and D) after treatment with fulvestrant. At the same time, the extracranial metastases did not respond much. The planned stereotactic radiotherapy (18 Gy/1 f), for the intracranial tumors, was performed and a second dose of fulvestrant was administered to the patient. The MRI showed a diminished lesion after treatment, but a new metastatic lesion in the frontal lobe appeared on March 29, 2018, 1 month after treatment with two doses of fulvestrant. The extracranial disease progressed with new liver lesions and enlarged lung lesions, features asymptomatic of an intracranial disease. The publication of this case series was approved by the Clinical Research Ethics Committee of the Affiliated Hospital of Academy of Military Medical Sciences, China (approval number: ky-2018-10-91). Written informed consent was obtained from the patients and their relatives for publication of this case series including accompanying images.